The National Liberty Foundation is a Florida-based group of radical conservatives associated with the right-wing group that calls themselves the Tea Party. They use their Facebook to post lots of right-wing meme images and racist links. Yesterday, they posted the above image, which looks a whole lot like an anti-immigrant cartoon. 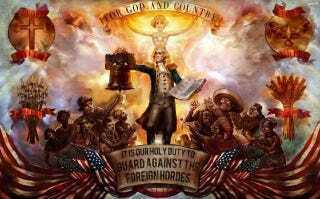 Well, it is an anti-immigrant cartoon—it's just from the video game BioShock Infinite, where it's used as propaganda for the Founders, a jingoistic, xenophobic group that runs the floating city of Columbia. They're the video game equivalent of the Tea Party, and they're portrayed as a nasty group of racist white men. In other words, this Tea Party group just Facebooked an image meant to satirize the Tea Party.